Hacker was a versatile talent who made a virtue of varying his style. In addition to painting portraits, he favoured symbolist subjects. The sfumato technique of the present picture, achieved by the cumulative effect of painting in glazes, is similar to that employed in Musicienne du Silence (Christie's, London, 11 June 2003, lot 15). The date of this picture must also be around 1900. The titles of Hacker's Royal Academy exhibits of around this date, The Golden Hour (1899, no. 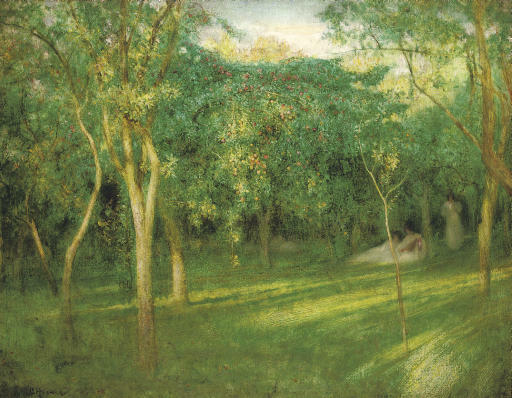 640), or The Gloaming (1909, no. 120), make a precise identification of the subject difficult. Given the scale of the picture, it was undoubtedly exhibited however.